Call this number and you might get served with a subpoena. 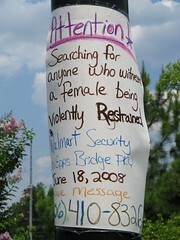 "Attention: Searching for anyone who witnessed a female being violently restrained by Walmart Security on Epps Bridge Pky. June 18, 2008." That stuff happens all the time @ Wallyworld.